New police tactics being used against motorcycle and scooter thieves appears to be having an effect with new figures showing a significant drop in overall thefts. It still makes for pretty grim reading with 27,000 motorcycle and scooter thefts being reported in 2018 but that is down by around 20% over the 34,000 thefts recorded in 2017. A part of this drop is being put down to the use of a ‘tactical contact’ policy being used across the Metropolitan Police area of London where the scooter and motorcycle-enabled crime has been the worst of all areas. The Met Police use tactical contact to knock scooter and motorcycle thieves off their stolen rides if it turns into a chase; a decision that has been backed by PM Teresa May and the highest-ranking Met Police officers. Early figures for the start of 2019 suggest the fall in stolen motorcycles and scooters is continuing. None of this changes the fact over the past five years almost 80,000 motorcycles and scooters have been stolen and disappeared without a trace. Many of these have been shipped abroad or broken for parts and sold illegally. What else is part of the drop in stolen figures? For the best part of the last 10 years, vehicle crime hasn’t been anywhere near the top priority of any police forces in the UK as they have been working with reduced budgets and fewer officers. As a result, stolen vehicle specialist teams have been disbanded and vehicle crime started to rise; car crime has risen by 50% in 2018 and the Home Office has now recognised this is a priority crime as it leads to other even more serious crimes being committed. In London, stolen scooters have been used to commit violent street robberies, armed robberies with riders and passengers free to escape knowing the previous ‘no pursuit’ policy left them untouched. The change in priority means resources can be used to tackle this problem, thieves know they run the risk of being knocked off by a pursuing police car and motorcycle and scooter riders have been made fully aware of the need to lock their bikes up more effectively. So serious is the motorcycle and scooter theft issue being taken that the Home Office, earlier in 2019, set-up a new vehicle taskforce to tackle the nationwide rise in thefts and general vehicle crime. The new taskforce is being lead by Policing Minister Nick Hurd MP and will be working with a group that will include a number of different police forces, insurers, the office of the London Mayor and the motorcycle industry body the Motorcycle Industry Association (MCIA). A full report is expected from the taskforce imminently which will lay out plans to further reduce the theft rate. 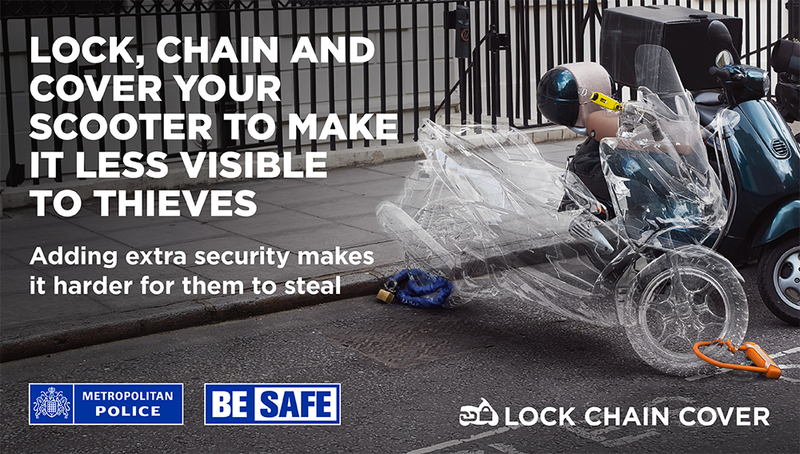 The Met Police Lock, Chain, Cover campaign is aimed at making two wheel vehicle owners more aware of the need for additional, physical security like locks, chain and bike covers in order to reduce the ease with which they can be stolen. The worryingly high rate of motorcycle and scooter thefts has not been helped by the number of two-wheel vehicles that have absolutely no security measures used while they are parked in public areas. A favoured technique of thieves when they find motorcycles or scooters that haven’t been secured is to break the steering locks and then use another stolen scooter with another rider onboard to simply push them away. By using a disc lock, a chain and covering the motorcycle or scooter it makes them much less attractive.